Jessica Börjel made her first vocalist recording as a three-year-old at her father’s studio (Kvicksound). As a nine-years-old she devoted herself to the Western concert flute, an interest that stayed with her until her early twenties. By then she had both played in orchestras like Eskilstuna Gardet as well as featured a couple of local hard rock bands on their recordings. However Jessica’s heart kept beating for rock music, grunge, synth and punk rock, music that the flute was not fit to accomplish. During the mid-90’s Jessica entered the stage as lead singer for bands like No Name, Remedy, Gurkblås and Take Cover. All cover bands with their musical base in pop and rock. She says: – “I had a lot of fun during those year and learned a lot about the life on stage. I also got to develop my vocal versatility since the spread of musical style varied amongst the bands. I remember one time when Take Cover got on tour to Gothenburg with all ten musicians plus gear stuffed in an old re-build public transportation bus. The pieces of the bus fell off one after another and there was moments where we seriously doubted that we were going make it in time. However with a bit of creativity and a paper telephone catalogue (no one had mobile phones back then) we got the bus fixed.” And how did the gig go? “It was definitively one of our best” she says smiling. Finishing her university studies and making her carrier in a separate field she moved to Stockholm in 2001. 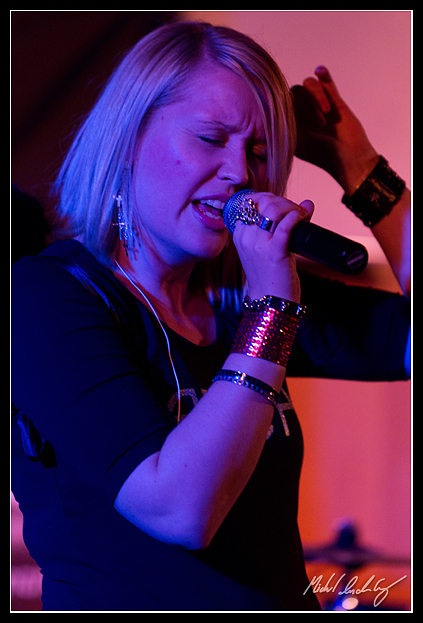 Jessica performed during 2001-2008 on the acoustic stage with her husband and guitarist Rickard Börjel. She also featured other artists in recordings in her father’s studio. It took until 2009, when six people with the same burning desire to play music met at a company office in Kista, until she would raise her voice on the rock scene again. This was the foundation of Powerhell! Jessica’s vocal source of inspiration comes from a broad range of artists like P!nk, Gwen Stefani, Fergie, Louise Hoffsten, Maja Ivarsson, Hayley Williams and Sheryl Crow.